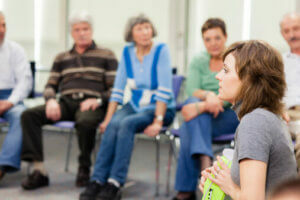 Time spent looking for addiction treatment can be stressful. But if you’re searching for residential treatment programs in Broward County, you’re on the right track toward a brighter future for yourself and those you love. The overall picture for addiction isn’t good. The Substance Abuse and Mental Health Services Administration’s (SAMHSA) National Survey on Drug Use and Health reported that 22.5 million people needed treatment for a substance abuse problem in 2014. However, the vast majority didn’t make it as far as you have in a search for the right treatment center, as only 4.2 million entered a program. To ensure you or the person you love with a substance abuse problem gain much-needed help, don’t wait to reach out to residential treatment programs in Broward County, such as 1st Step Behavioral Health in Pompano Beach, Florida. When looking at addiction treatment programs in Broward County, many patients first consider inpatient or residential rehabilitation. Under the right circumstances and when deemed medically necessary, residential treatment can provide the more comprehensive care and structure most beneficial to a patient wanting lasting recovery. According to SAMHSA, treatment that is longer in duration provides greater benefit for long-term sobriety. Patients being treated in 1st Step Behavioral Health residential treatment programs in Broward County are provided with 24-hour supervised care by highly qualified and experienced specialists who understand addiction and the struggles of recovery. This supervision is especially beneficial for patients with lengthy histories of drug or alcohol abuse or those with co-occurring conditions requiring medication management. Around-the-clock care usually starts in residential detox and continues through the rehabilitation program. The sheltered, secure environment of residential treatment programs in Broward County provide distance from distractions of everyday life at home, as well as time away from triggers and temptations that often lead to substance use. Through focused residential treatment, guests are able to strengthen and learn coping skills to prevent these issues from leading to relapse after returning to their own community. In review of treatment options, you likely have developed many questions about entering treatment in Broward County. The experienced admissions specialists at 1st Step Behavioral Health can answer your questions over the phone. These specialists can also review your health insurance or other payment options to aid in decision making. Why travel to Broward County for treatment? Whether you enter residential treatment, PHP, outpatient or intensive outpatient rehab, treatment in Pompano Beach, FL can provide space from your triggers of abuse. Traveling to treatment is often preferable to local options and is still likely covered by your insurance. How will I be able to keep my job if I enter residential treatment? Employee Assistance Programs (EAP) help employees suffering from substance abuse gain treatment by providing temporary medical leave. Your HR department can clarify your company’s policies. You may also have accumulated leave time or other leave options. Regardless of whether your employer stands behind your decision to get treatment, entering rehab is meant to save your life and provide greater opportunity in your future. Will my insurance help me pay for treatment? Since the passing of the Affordable Care Act and associated legislation, insurance has been supportive of addiction treatment. Although the amount a policy pays depends on your specific policy, the American Medical Association has recognized addiction as a disease that requires medical treatment. This means that residential rehab, when deemed medically necessary by your healthcare provider, should be at least partially covered by your health insurance provider. Do I need to detox before coming to residential rehab? Although it varies from rehab to rehab, 1st Step Behavioral Health provides residential detox prior to rehab. If you need to detox, you can easily gain that help before smoothly transitioning into the rehab program. 1st Step Behavioral Health provides residential rehab as part of a continuum of care that includes evidence-based therapies, holistic programs and dual diagnosis treatment. If residential treatment isn’t ideal for your particular situation or level of need, outpatient, PHP and intensive outpatient programs are also available for alcohol and drug addiction treatment. Call 1st Step Behavioral Health now at 866-319-6126 for more information and to speak with an admissions specialist. With only one phone call, all of your questions can be answered and you can gain immediate support and help from the experienced professionals of 1st Step Behavioral Health.